There are a few physicians who are not on your system ie their billing numbers ... is there a way to access this on your end. or do i need to ask them to get it. Please note, if the Physician/ NP billing number cannot be found in our system, you can request it directly from the Referring Physician/ NP and enter it into our database. To enter a referring physician/ NP into the database please follow these instructions: Click on the CLAIM tab. 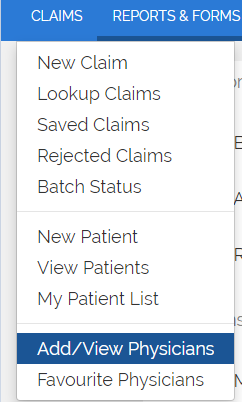 Once there select “Add Physician” on the left-hand side of the screen.